Product code: ES8300 Categories: Art Deco, Art Deco Rings & Art Deco Engagement Rings. Here is a truly exceptional Art Deco emerald and diamond ring dating from the 1920’s that is not only set with fine quality natural Colombian emeralds highlighted with diamonds, but also has the most exquisite detail on the side. Beautifully hand made in 18 carat yellow gold and platinum, the ring is set with three magnificent quality Colombian emeralds. Regarded for centuries as the home to the worlds finest emeralds, the colour and transparency in these emeralds showcases the quality one would expect from a fine Colombian emerald. The emeralds total 1.58 carats and are perfectly matched for colour and clarity and from near or far, they will always capture the eye and be commented on. Set in the ring are not two but actually ten diamonds. With one large European cut diamond set on each side of the centre emerald, there are also four antique rose cut diamonds set on each “corner” of each diamond. These additional diamonds show the thought that was spent in hand making this ring all those years ago and shows why there is nothing quite like a genuine ring from the Art Deco period adorning your finger. The European cut diamonds total 1.06 carats and the rose cut diamonds 0.04 carats and the sparkle from the diamonds is amazing. And then admiring this ring from the side will take your breath away as you see the exceptional fine quality that went into hand making this ring. Today many rings are cast made and although this is good to mass produce and therefore reduce the cost of making rings, you certainly lose out on the detail as well as not being able to get a ring cast in one go in a combination of both gold and platinum such as this ring here. The setting for both the emeralds and diamonds is just wonderful to admire and is a real testament to the quality of work and craftsmanship that is complimented by the fine emeralds and diamonds. 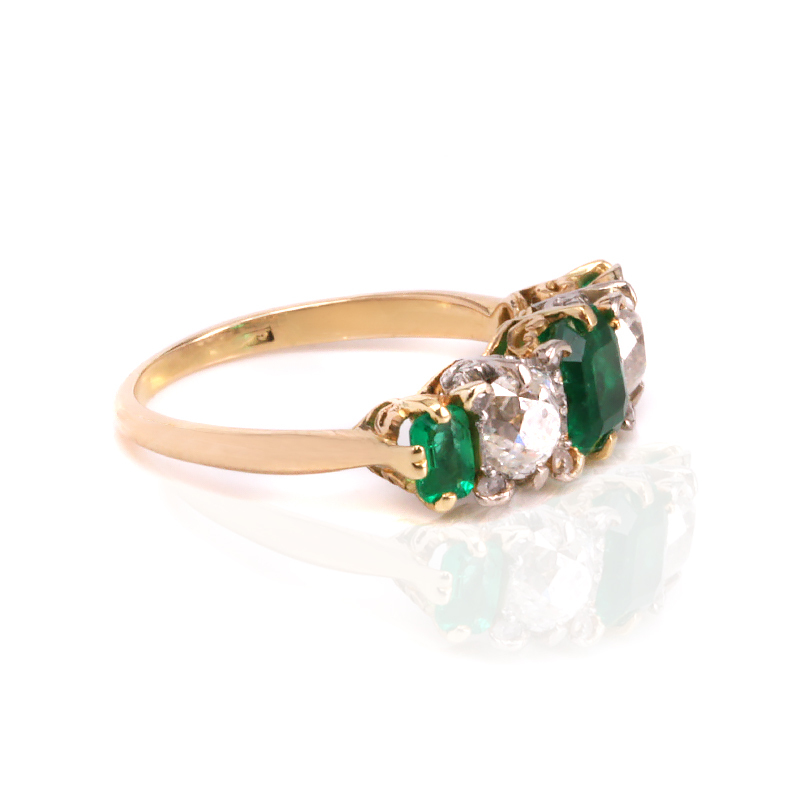 This is a spectacular example of an Art Deco emerald and diamond ring at its finest. 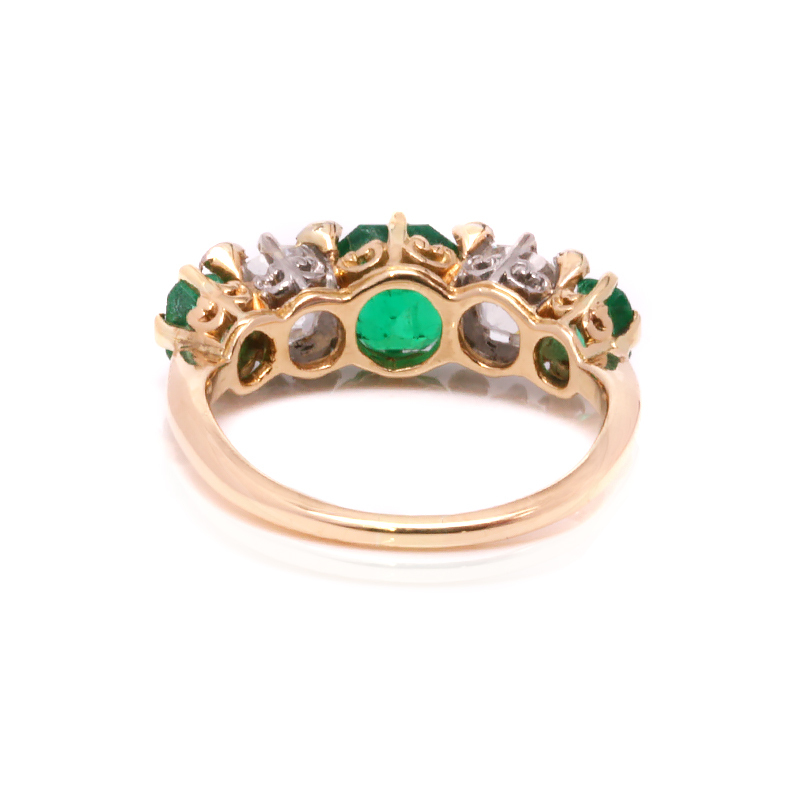 This emerald and diamond ring was hand made in 18 carat gold and platinum. Set with Colombian emeralds and European cut diamonds and rose cut diamonds. Colombian emeralds have long been regarded as the source of the best emeralds in the world. 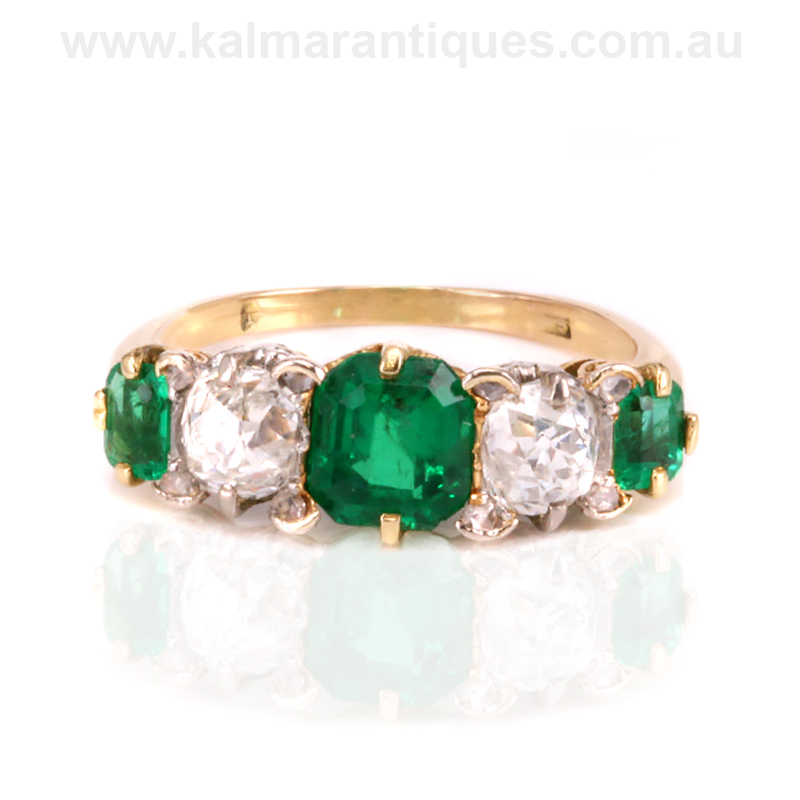 With a fine green colour and excellent transparency, the emeralds in this ring are spectacular. A ring such as this would suit any finger and occasion including making a wonderful example of an Art Deco emerald and diamond ring.